Modular building on Upper Main street Edgartown is out of compliance with original special permit. 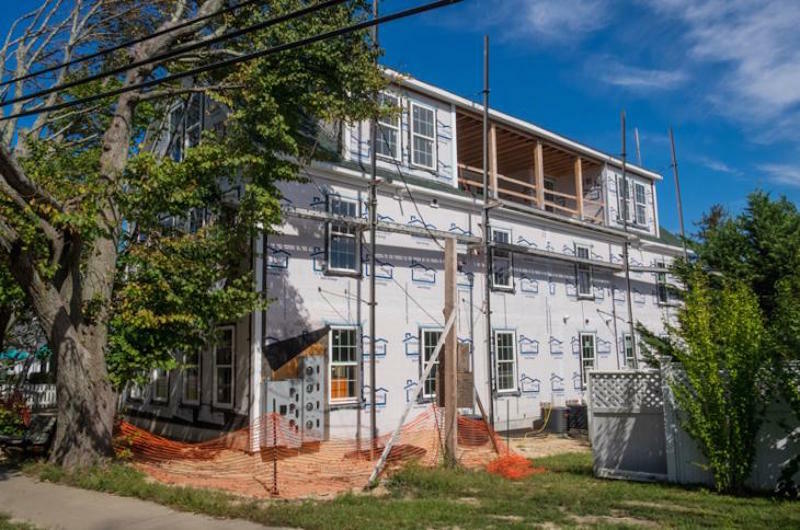 The unfinished Wave Lengths Hair Salon building on Upper Main street Edgartown will return to the Martha’s Vineyard Commission for review, in light of unapproved changes to the building. The commission first approved the project as a development of regional impact (DRI) in 2010, with modifications in 2011 and 2014. Commissioners voted 10-3 last week to require a new public hearing for changes, which among other things exceed a height restriction for the commercial district on Upper Main street and stray from previous DRI approvals. Plans for the three-story building call for commercial space on the first floor, and offices and apartments above. Last spring the town planning board issued a cease and desist order shortly after construction began, later determining that the project was out of compliance with the original special permit. The MVC will review a new special permit application that includes the changes already in place, along with a request to exceed the building height restriction. Changes to the building from the original plan include reshuffling features such as windows and a second-floor balcony, larger dormers on the third floor, and the top of an elevator shaft designed to look like a widow’s walk. A list of 13 requests by the planning board in September aimed to mitigate the changes, although Wave Lengths owner Jayne Leaf has not agreed to reduce the size of the dormer over the front entrance. Commissioners noted the extensive review process and enforcement powers related to special permits in Edgartown, as it debated whether to require a new hearing. “We can give a larger forum for people to express their opinion,” commission chairman Jim Vercruysse said, adding that he did not believe the planning board would have as wide an audience. Commissioner Clarence A. (Trip) Barnes 3rd said he believed the modifications had been unintentional, resulting from “a comedy of errors,” and he questioned the need for MVC review. “I can’t imagine that this is going to have a lot of Island appeal,” he said. But commissioner Christina Brown, who is from Edgartown, said many people have wondered why the project was not built as planned, and she supported the idea of a new hearing. “I think it could clear the air,” she said. A hearing date will be scheduled. If a permit was issued for a specific height, it must be adhered to. Get the crane back, pluck the top level off, put it back on the trailer. Problem solved. I fully agree with the above comment. Height restrictions are set for a reason. We don't want Upper Main St. to loose it's integrity as it is the entrance to our beautiful town. We already have the "above the post office" debacle that violated many safety codes and permitting and has created a real eye sore for the triangle. Thank you for enforcing what was approved. And...we will soon be looking at plans for the new S&S...let's not set a precedence for Edgartown that "anything goes". If there are safety concerns at the above the post office as you say please let the building inspector, health or fire department know. They may miss something but I know if brought to the public attention they will get fixed. BTW what are the missed violations? If you allow one to violate the approval, how can you say no to the next and the next and the......... Also, can the building be any closer to the street??? What an eyesore! The town made them move it that close. As an architect I appreciate that the powers that be make sure that zoning restrictions are adhered to. I've noticed many buildings on the vineyard that clearly do not comply. It's an affront to those of us that follow the rules, to see people do what ever they want and suffer no repercussions. Penalize them for their arrogance of non compliance to their agreement! Bring the crane and take the whole ugly thing down! How did it get so far along? Are inspections not preformed as projects proceed? Might just might be more involved than we know. The Basement only holds a machine room for the elevator. It is possible that we would use it in the future but a permit would have to be applied for separately and go through the same process AND can only be used in conjunction with first floor businesses. The owner Jayne Leaf of Wave Lengths would like at some point to expand her spa services and use some of that space for that but right now its def. empty. I just want to clear up a couple of things. The height restriction pertains to an elevator vent for the shaft not the building over-all which is below the 32-foot height limit. The original architect did not allow for a necessary vent in the plans. Additionally, an elevator vent shaft is considered an appurtenance by code and allowed to extend above the restricted height. The elevator is a necessary device to make the building 100% accessible to handicapped persons which while not required should be considered a good thing, especially to handicapped individuals who would like to own or visit the above ground floors. Also, while the third-floor layout changed and the dormers are slightly larger due to it being a high energy efficiency (363%) building made of a super insulated exterior shell, the rest of the building, height, set-backs, foot-print etc. are exactly as permitted. A lot of effort has gone into working out a solution to this and I just want everyone to know that this is not a case of purposely ignoring approved plans.